Budapest and Paris are my two favorite cities in the world. Both originated and grew on the banks of a river; Paris along the Seine and Budapest along the Danube. The Danube is the second longest river in Europe after the Volga. Since the Middle Ages it has been the connecting route between Eastern and Western Europe. It starts out in the Black Forest and end in the Black sea. It is more than 770 miles long. In Hungarian, it is called the Duna. Hungary's other two rivers flow into the Danube. The Tisza and the Drava. In 1992 a canal was opened to connect the Danube with the Main River and the Rhine River. This created a new river route linking the North sea and the Black Sea. Budapest and Paris both are seeping with history. Freedom Square, also called Liberty Square, is a prime example. In Hungarian, it is called Szabadsag ter. It is home to the American Embassy. The Plaque on the wall of the Chancery in memory of Cardinal Mindszenty. The Plaque on the wall of the Chancery in memory of Cardinal Mindszenty. 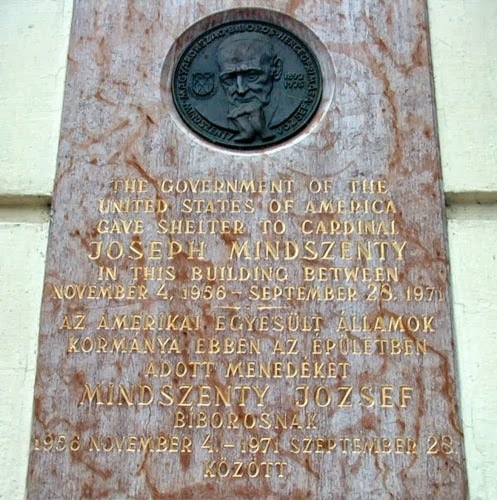 "THE GOVERNMENT OF THE UNITED STATES OF AMERICA GAVE SHELTER TO CARDINAL JOSEPH MINDSZENTY IN THIS BUILDING BETWEEN NOVEMBER 4, 1956 - SEPTEMBER 28, 1971"Freedom Square was built on the site of the old Austrian barracks. The Austrians built their barracks in 1786. They became a symbol of repression. So, at the end of the 19th Century the barracks were destroyed. The Square is large, open, and beautiful. It is lined with buildings with massive facades, such as the former Stock Exchange, which is today the headquarters of MTV Televizio, National Television. Opposite it is Hungary's National Bank, Magyar Nemzeti Bank. North of the Square, laid out in a half-circle, is the only remaining monument dedicated to the Soviet Russians. it is an obelisk in memory of the Red Army soldiers who liberated Budapest in 1945. The American Embassy is located on the opposite side of the street. There is a statue of President Ronald Reagan behind this Russian obelisk. There is an inscription that says "A country boy against the evil empire". It is written in both Hungarian and English. The placement of President Reagan's statue behind this Russian monument was hardly an accident. It just goes to show you that the Hungarians have a great sense of humor. Now, as you walk towards Kossuth Square you will pass a statue of Imre Nagy. He was one of the heroes of the 1956 revolt against the Russians. He was executed by the Russians. There is a great story behind this statue of this American general. 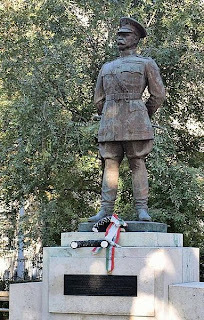 This statue is in the center of the park on Szabadság tér, facing the American Embassy, is that of Harry Hill Bandholtz, Brigadier General, U.S. Army, who was Provost Marshall to General Pershing at the end of World War I. On August 11, 1919, General Bandholtz arrived in Budapest as one of four generals (English, French, Italian, American) to become the Inter-Allied Control Commission for Hungary, primarily to supervise the disengagement of Romanian troops from Hungary. 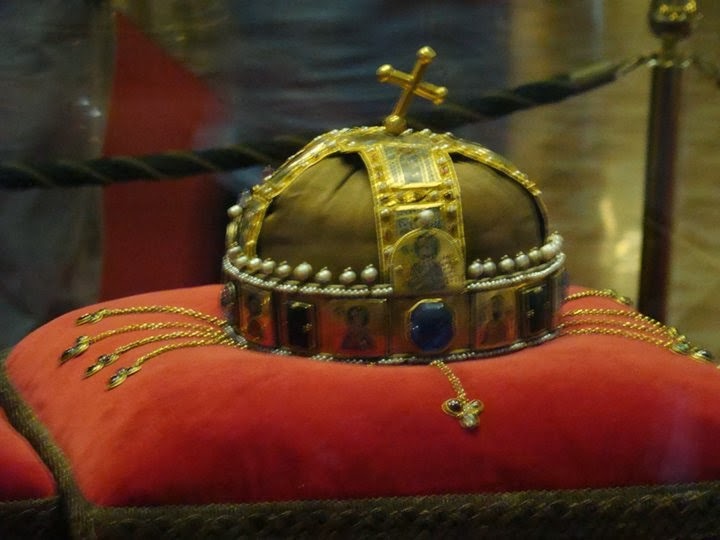 He became famous when, on the night of October 5, 1919, as President of the Day of the Commission, mainly through bluff, armed only with a riding crop, he prevented a group of Romanian soldiers from removing Transylvanian treasures from the National Museum. The statue was erected in 1936, and stood throughout World War II with the inscription, in English, "I simply carried out the instructions of my Government, as I understood them, as an officer and a gentleman of the United States Army." In the late 1940s the statue was removed "for repair." It lay in a statue boneyard until the 1980s, at which time it was placed in the garden of the U.S. Ambassador's residence, at the request of then-Ambassador Salgo. It was re-placed in Szabadság tér at its original location in July 1989, just a few days before the visit of President Bush. The new inscription on the back reads: "General Harry Hill Bandholtz, head of the American Military Mission, who on October 5, 1919 blocked the removal of the treasures of the National Museum to Romania." Between August 1919 and February 09, 1920 he was the U.S. representative to the Inter-Allied Supreme Command's Military Mission in Hungary. The Military Mission was charged with disarming the Hungarian military and supervising the withdrawal of the Serbian and the Romanian armies that were occupying Hungary. According to the General's accounts he prevented the arresting of the Hungarian Prime Minister, Istvan Friedrich by the Romanians. He is also remembered for preventing Romanian soldiers from looting the Hungarian National museum on October 5, 1919. It is little wonder that the Hungarian people dedicated a statue to this General. Major General Bandholtz is widely considered to be the "father" of the United States Army's Military Police Corps. Parizsi udvar, or the Paris Passage, is one of Budapest's most popular sights; not for its shops, but for its architecture. It is both Byzzntine and Moorish at the same time, or perhaps, a bit Venetian; or, perhaps Art Nouveau. In any case, it is a strange mixture. The name goes back to the 19th Century. It alludes to the covered passages which were then fashionable in Paris. Construction for saint Stephen's Basilica (Szent Istvan's Bazillika) began in 1851. It was completed in 1906. The streets leading from Freedom Square to St. Stephen's Basilica are lined with delightful little restaurants and shops. The sidewalk cafes will remind you of Paris. In the Summer they are very busy. Parking was never easier. Modern high rise garages store cars on raised platforms.